The Pirates complex at McKechnie Field in Bradenton is pretty good, but not one the best or most thrilling in Florida. The seats are extremely close together, and there is no particular gimmick or interesting feature that makes this stadium stand out. However, on the positive side, the stadium does have some pretty good food. I seem to remember that the concession stand sold Subway sandwiches. Also, the entire stadium was cleaner than most, which is a definite pluss. The stadium does have a large white grand stand, which can be beautiful on one of the bright, sun-shining baseball days. One thing going for this stadium is that I seemed to be able to get more autographs here than any other stadium. I probably got 25 in one day, without even struggling. When I went they had two different players signing autographs at a table on the first base side of the stadium (I think). I think they had a different pair of players every week or something. You should probably call to find out the schedule of player appearances. The Pirates were extrememly generous with autographs. In fact, the Pirates probably sign more autographs than any other team I have encountered. Judging from their performance in recent years, they need all the good PR they can get. If you are going to be in Florida for a while, you should stop by the stadium in Bradenton, but if your time is tight, then you won't be missing anything here. 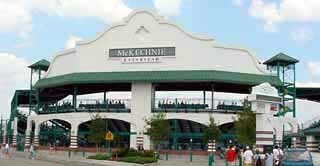 "McKechnie Field where the Pirates have ST is a easy place to get autographs. When I went I saw a lot of players signing - Raffy Furcal, Andruw Jones, Glenn Hubbard, Leo Mazzone, Kevin Millwood, Randall Simon, Steve Avery, etc. I'm a Braves fan, so I stood by their locker room/bullpen. The players < mostly pitchers> hung out and stretched out there, so they would come and talk to the fans and sign things. All the players are constantly walking back and forth from there to the field during BP, so a lot will stop and sign. Same thing if you stand on the Pirates side. Over there I got Jason Kendall's autograph. If you stand along the 1B or 3B lines you'll have a good chance of stopping someone and getting their autograph." This is my view from the very end of the first base line. These were not bleacher seats, but as you can see from the picture, the seats are cramped and the view was not too good. This is the stadiums' greatest feature. On certain days two Pirates will sign autographs for fans before the game. This is much more organized than running around the stadium like a chicken with its head cut off to get autographs, and the players are usually happy to chat with kids. Some fans who were anxious and did not want to wait on line for autographs were able to find these batting cages on the first base side of the stadium. As you can see, not too many people were hanging around this location. This very unique grandstand is a refreshing departure from the bland, grey exteriors of some of the other stadiums in the Grapefruit League. It helps to add a retro feeling to the facility. Autograph tip: The Pirates sign more autographs than any other team, so your best bet would be to hang around their dugout and bullpen prior to the game. Wait in line at those tables if players are signing autographs the day you visit, and go to the batting cages next to them too. "In Bradenton (Pirates) it's set up so that you can stand right by the entrance to the visiting teams clubhouse. It can get crowded but it's an excellent place for autographs if you can get a space by the railing. Also, if you're in to Pirates autographs you can go to their practice facility which is a few miles away from McKechnie field. This is a great place because you can get practically right next to the players and it's a much more relaxed atmosphere because a lot of fans don't know about it. If you want to see veteran players you need to get there in the morning (several hours before game time) on home game days. Last year I got Jason Kendall and Brian Giles to sign at the practice facility."